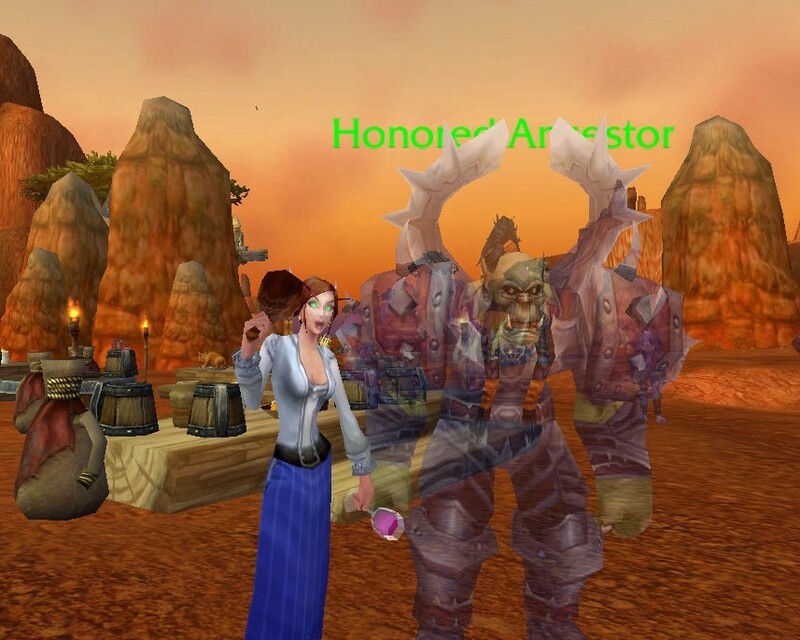 Today, September 27th, marked the first day of the Harvest Festival – a time in which both the Horde and the Alliance take the time to honor their fallen heroes. Inter midst all the drunken happiness and ram racing of Brewfest, the Honored Ancestor spirits appear around large tables of harvest food and drink. 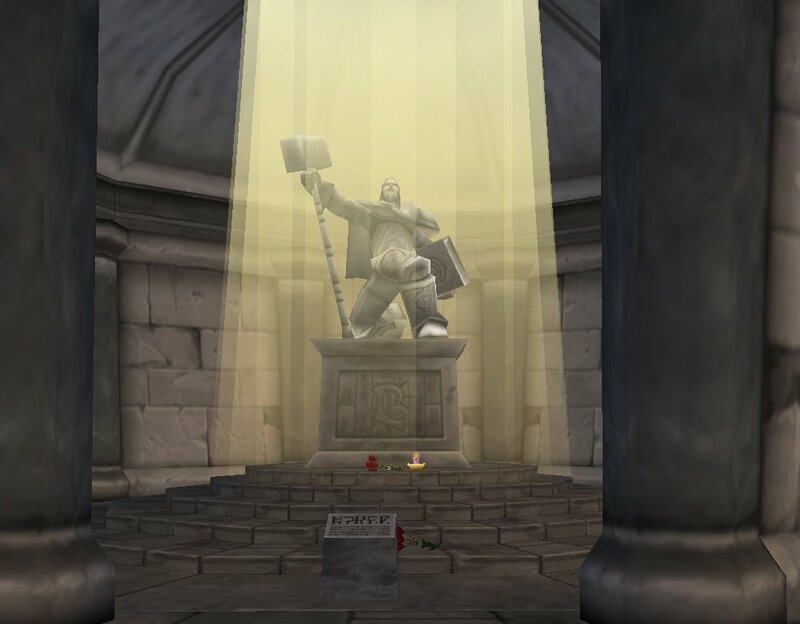 Take some time to visit the monument for either the Horde’s Grom Hellscream or the Alliance’s Uther Lightbringer. Just a simple outfit to wear while eating outdoors. The Emblazoned Hat can be replaced with any other brown hat to meet ones armor availability. The Journeyman’s Robe is easily swapped for the Simple Dress…although, it might be getting a little “chilly” in-game (it’s fall time now) for its short sleeves. 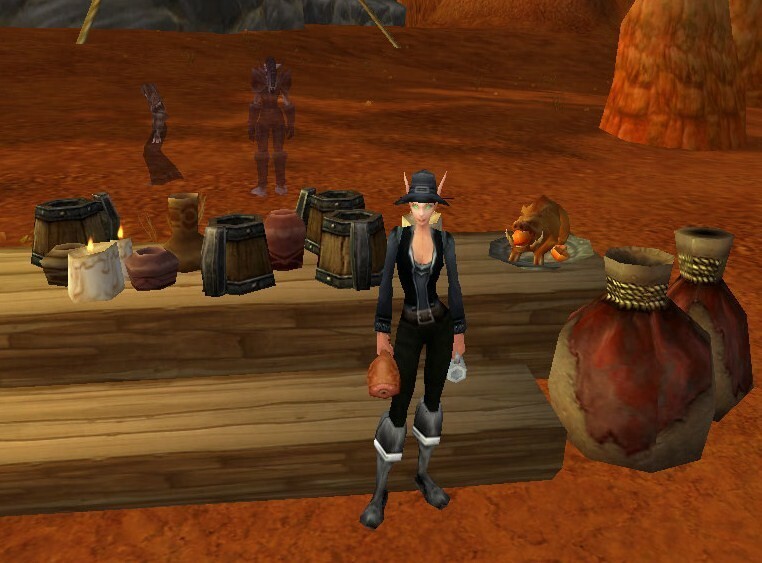 The Whispering Vest can be bought in limited quantity by several vendors – I got Kirina’s from a goblin in The Barrens. The red/orange accents on the vest match well with the Orange Mageweave Shirt for longer sleeves. For those without a Weather Beaten Fishing Hat, there are many alternatives, such as Russet Hat (for a more embroidered look) or the Crochet Hat (for an exact match). This outfit has a more traditional feel to it, and uses common chest and leg armor that make a great outfit on their own. The Comfortable Leather Hat is the same model as the Emblazoned Hat, only black. There are some other black alternatives, such as the Fireheart Skullcap, or the Nocturnal Cap. The buckle on the Ruffian Belt matches the one on the hat, but, any black belt can be used in this outfit. The Haliscan Pantaloons are a very fancy black pant alternative to the Black Tuxedo Pants. Not only is it a common item and can be sent to alternate bank characters to save bag space, it can also be worn by those low level bank alts, as it has no level requirement. The Shadow Council Tunic is an Outland’s world drop, but has different colored substitutes, such as the Embroidered Armor. Again, a very simple, casual outfit to throw together, yet still very elegant. The Ruffian Belt can be replaced for a brown belt, like the Knitted Belt, with no loss of style. This was the robe that made me finally decide to go ahead and write this article for the site. 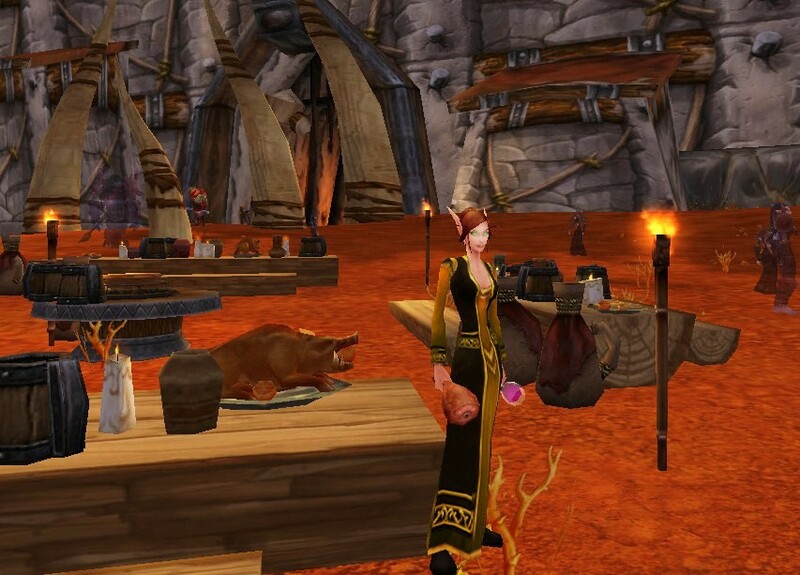 It’s the same style of such robes like the Robes of Arcana or the Beastwalker Robes, only a festive, and unique, yellow/orange color. I feel the colors of it are perfect for a harvest and for the turn of the season to autumn. 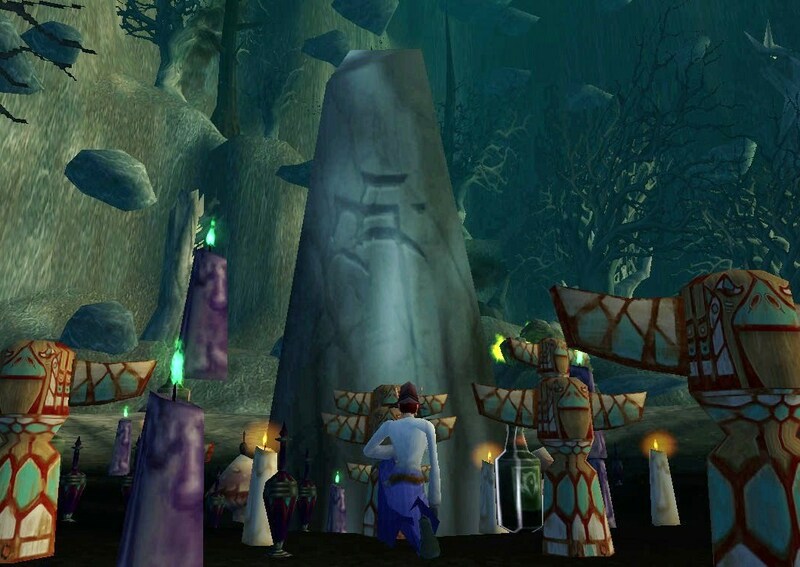 The Sacrificial Robes is dropped by a mob out in Redridge Mountains, Morganth. 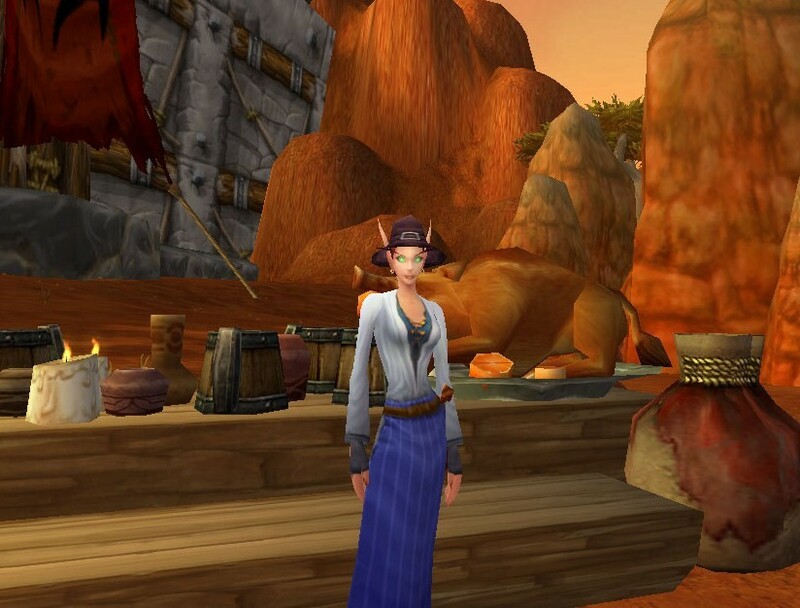 Although this mob is to be killed as a part of an Alliance quest, both factions are able to easily farm for this robe. It took me about 30 minutes on Kirina to finally get this to drop for me; however, a good portion of that time was waiting for the mob to respawn – which is anywhere between 5-8 minutes. I feel it was well worth the waiting. Can you hear his scream? We honor him, and we shall give him thanks! Excerpt from: For the Light! 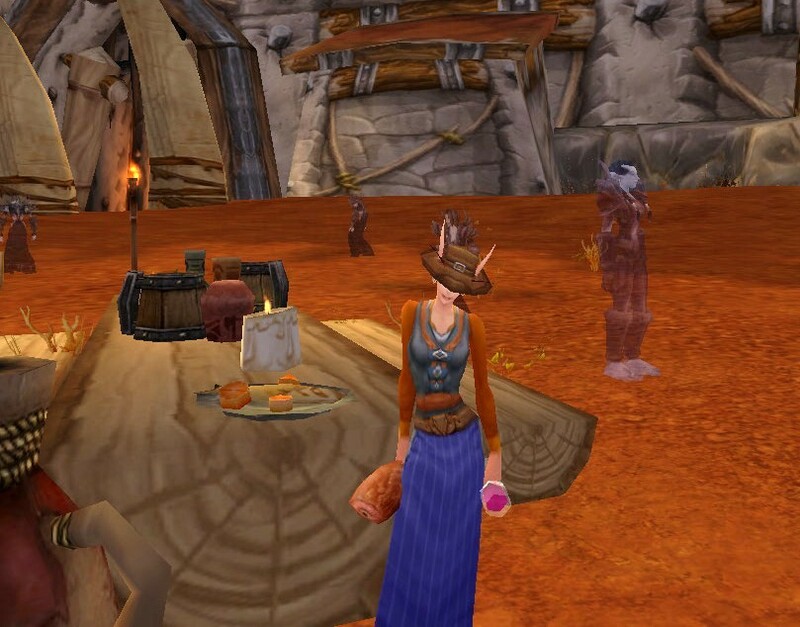 I hope everyone has a good Harvest Festival, which ends the same day Brewfest does. 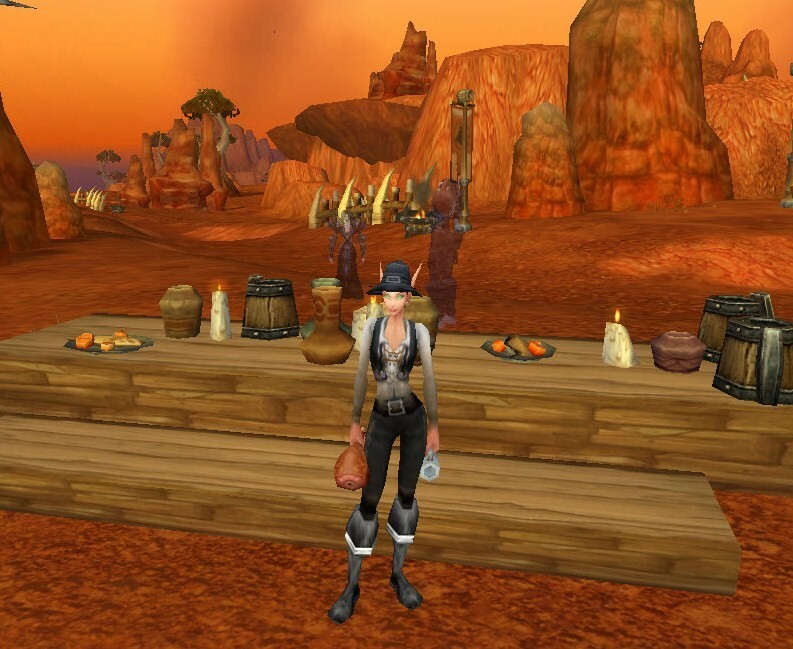 Don’t forget to stock up on some delicious harvest food and ale from the tables.